With its long coastline Cornwall has always been a potential landing point for the armies of foreign conquerors. 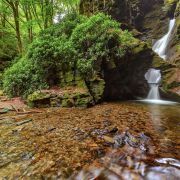 To some extent the often wild Atlantic ocean and rugged nature of much of Cornwall's coast offers a fairly good deterrent to would be invaders. Over the centuries foes have changed and Cornwall's most recent fortifications are the pill boxes that sprung up on many beaches during World War II. However, the oldest forts and castles in Cornwall go back thousands of years with the prehistoric hill forts and cliff castles that are quite unique to this part of the World. In this list there is a variety of castles from all ages. The order is a little arbitrary as each has they are all amazing places that positively radiate history. Sitting on the cliffs just south of Readymoney Cove and defending the rivermouth at Fowey is St Catherine's Castle. The little castle was built in 1536 as part of Henry VIII's coastal defences against a possible French invasion. 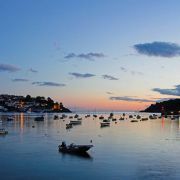 The castle has a great viewpoint over the entrance to fowey and contributed to the existing defences of this port. 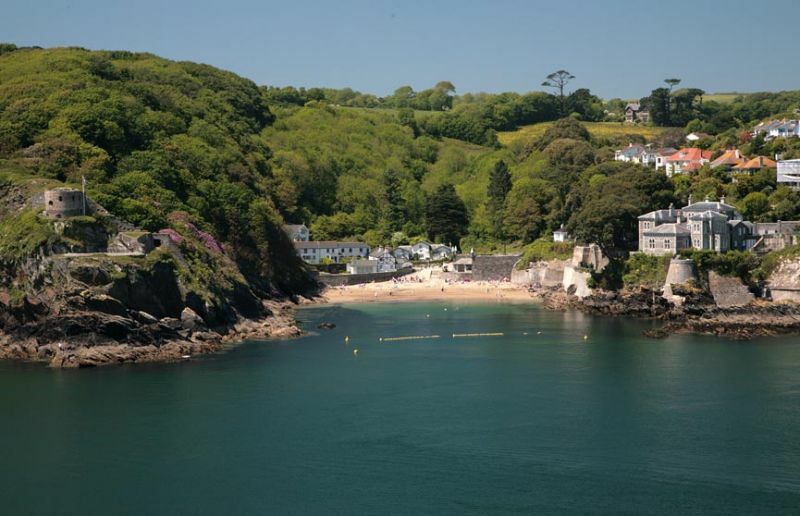 Fowey's previous defenses were the two blockhouses which sat on either side of the entrance to the harbour. These originally had a massive iron chain between them that could be raised from the seabed to prevent enemy ships entering the port. All of Fowey's old military sites are now managed by English Heritage. It isn't difficult to see why the ancients chose Chun Castle's location. Situated on the high ground of the West Cornwall moors the views from here are panoramic. Thought to date back to at least Iron Age times(~2,500 years ago) this hill fort consists of a circular wall rising several feet above the surrounding moorland. It is possible that these walls were originally as high as 20ft (7m) but much of the stone was taken for building in the 19th century. 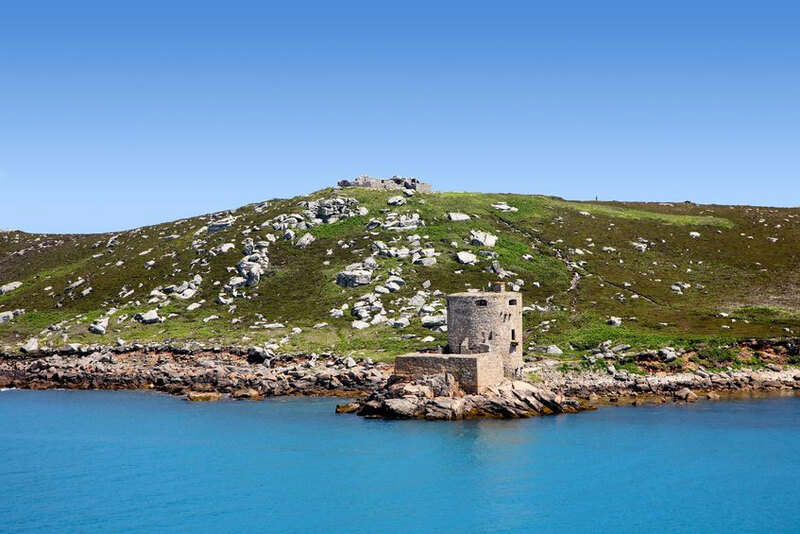 Given the fort's prominent position and clear views over the Atlantic, Mount's Bay and the only land route to the Penwith peninsula, it is likely that Chun Castle had a defensive purpose. 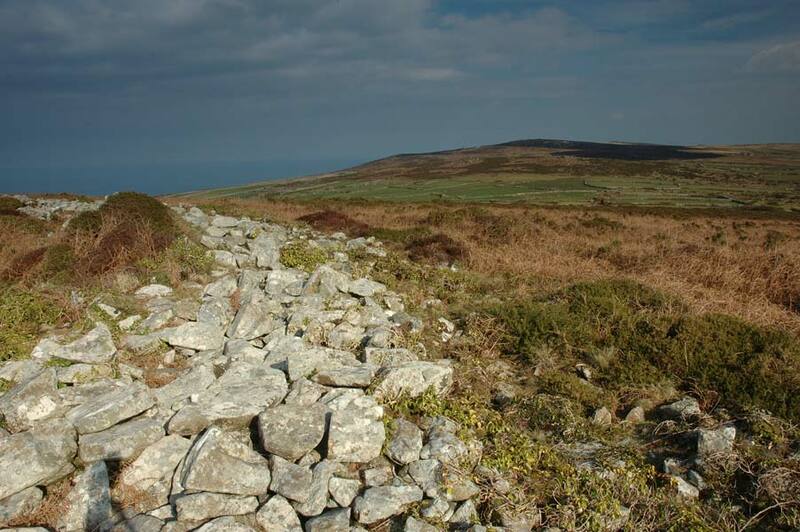 Even in those days the mineral wealth of west Penwith was deemed worth protecting. This 17th century round tower deserves a place on our list for its location alone. Positioned on a rocky promontory it guards the entrance to the safe anchorage of New Grimsby between the islands of Bryher and Tresco. The attillery fort was built in the aftermath of the English Civil War in which Tresco became a haven of Royalist supporters. Sir Robert Blake, the then head of the navy, was worried the pro-Royalist Dutch might try to use the island as a base to launch attacks on the mainland. To defend the harbour the 50ft high tower was constructed with its 13ft thick walls and loaded with canons. 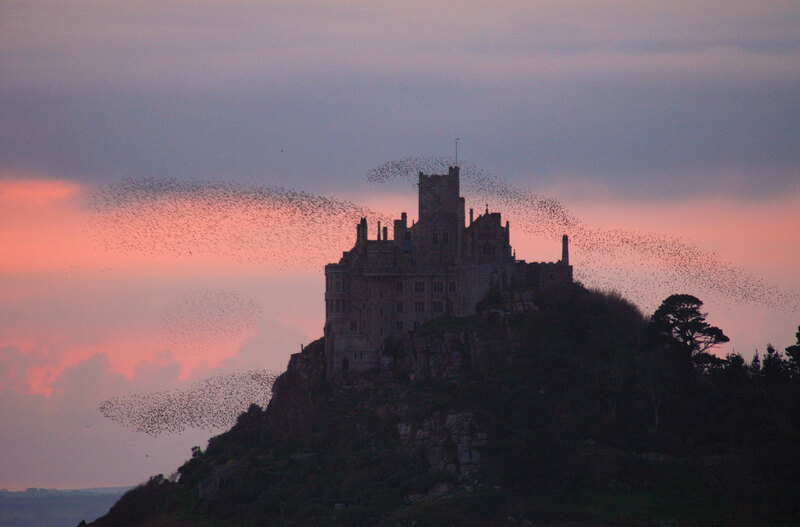 The iconic island situated a few hundred metres off the coast of Marazion has had many uses over the years. 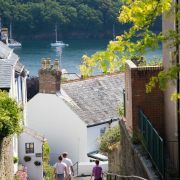 From a monastery to the family home of the St Aubyns it has always been a local focal point, even in prehistoric times. The earliest structure atop the island was a 12th century priory built be the same order of monks who owned Mont St Michel in Normandy. Around a hundred years later the island was seized by Henry La Pomeray and thus began its military development. Rather than demolishing the existing church buildings these were incorporated to the castle. Over time the impressive structure has grown in a seemingly organic manner to meet the requirements of the day. It has seen military action in several war including two sieges, the first of which lasted 23 weeks against 6,000 troops during the War of the Roses. Even as late as the 19th century canons here saw active duty against would be Napoleonic invaders. Whilst Caerhays Castle may be the most impressive looking castle in Cornwall it is actually all for show and was never a real castle. 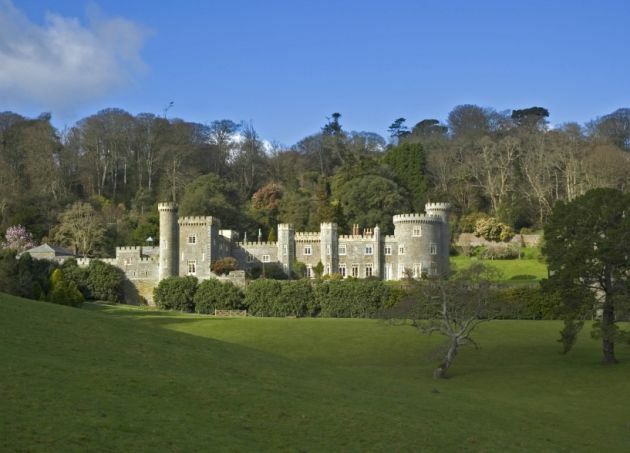 The castellated mansion was in fact the fancy of the Caerhays estate owner, John Bettesworth Trevanion. He commissioned celebrated architect John Nash to design the castle in 1805. The castle proved to be the ruin of the Trevanions who ran out of money before it was finished. The family ended up fleeing to France to avoid their debts and the house was bought by Micheal Williams, a local member of Parliament. Today the gardens are open to the public during the summer and the house remains a private residence. Possibly the most famous castle in Cornwall is Tintagel. 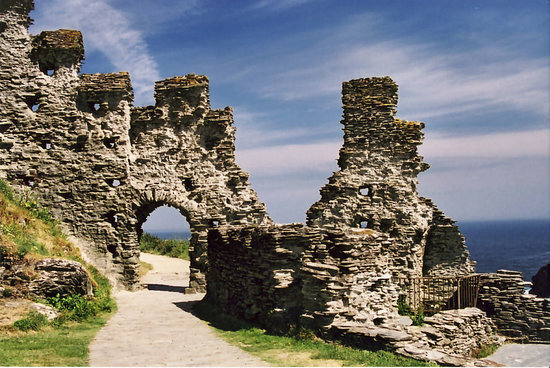 These clifftop ruins are believed by some to have been the fortress of King Arthur and legends abound. The ruins you see today are the remains of a Norman castle built here in the early 13th century by Richard, Earl of Cornwall, the son of the then king, John. However, this is not the first castle to have been built on this dramatic site; even the name 'Tintagel' translates as the "Fort of the Constriction". How far back the history of the site goes is uncertain but excavations in the 1930s revealed hoards of exotic Mediterranean pottery dating back to the 5th and 6th century. 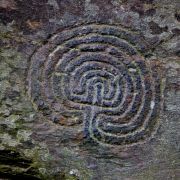 This suggests the castle was of some importance, possibly linking it to the powerful figures of the day such as Gorlais, Duke of Cornwall or even the Cornish King Mark. Perhaps the most tantalising find though is a 6th century slab inscribed "pater coli avi fecit Artognov" meaning "Artognou, father of a descendant of Coll, has had this built". It is possible that the name "Artognou" could be a Dark Ages reference to Arthur. Whatever the evidence for links with King Arthur the visitor centre here makes the most of the Arthurian connection. Whatever the truth there is no denying this is an awe inspiring location with a rich and mysterious history intermingled with legend. St Mawes Castle is another of Henry VIII's coastal defences. Also built in the 1530s this castle is a much more impressive structure than St Catherine's and is also very well preserved. In fact the castle was described by one eminent historian as "arguably the most prefect survivor of all Henry's forts". Built as one of a pair of castles to guard the mouth of the river Fal and the Carrick Roads beyond St Mawes has a clover leaf shaped plan with three circular gun decks. Set in the middle of these gun decks is the four-storey central tower with a lookout turret topped with a 17th-century cupola. In addition to the functional military architecture of the castle has many period flourishes such as carved decorations of sea monsters and gargoyles. Whilst St Mawes Castle effectively served as a deterrent to a naval invasion it was less well defended from the land. During the English Civil War the fort quickly fell to Parliamentarian forces without a single shot being fired since the governor realised defending the castle was futile. There has been a castle on the hillside above Lostwithiel since Norman times owing to its strategic viewpoint overlooking the main crossing point of the River Fowey. The original castle on the site would have been a classic wooden motte-and-bailey construction. However, over the next 200 years the circular wooden structure was replaced with the massive stone walls that remain to this day. Restormel Castle is one of a relatively small number of circular shell keep castles and probably the best preserved example in Britain today. Within the exterior wall is a second wall which allowed the space between to be divided up into various rooms such as a kitchen, chapel and accommodation quarters. Visitors to the castle can access the upper level of the walls and walk around the perimeter, which provides great views out over Lostwithiel and the countryside beyond. 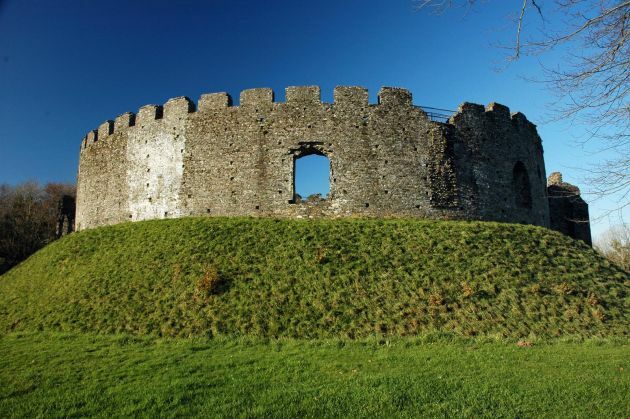 Now managed by English Heritage, Restormel Castle is well worth a visit both for the impressive structure and the lovely, peaceful location. 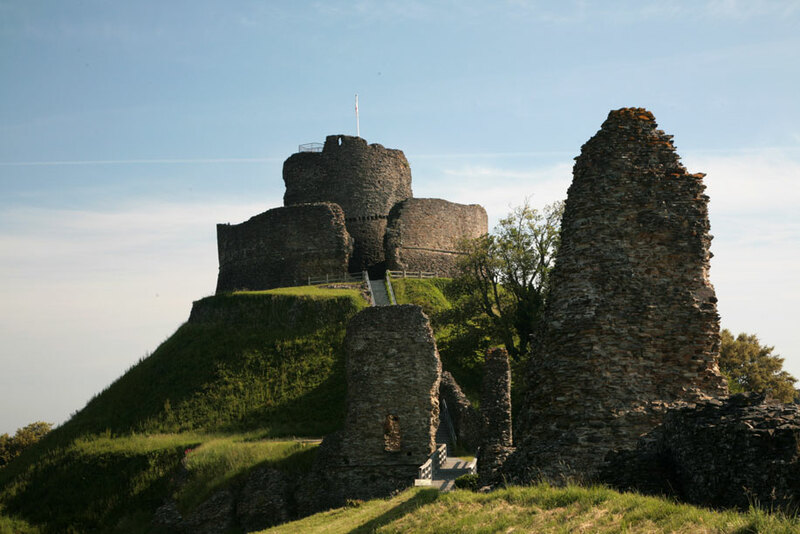 As the gateway to and ancient capital of Cornwall Launceston was one of the first places the Norman conquerors built a castle. As with Restormel this would have been a classic motte-and-bailey built of earth and wood. Again, the wooden walls were replaced with stone and the castle much expanded over the following centuries. Imposing gatehouses were constructed in the 13th century but this was the height of Launceston Castle's fortunes. Soon after the Cornish capital moved to Lostwithiel and the castle became less important. For centuries after the main function of the castle was as a prison. It was not until 1838 that the jail moved to Bodmin. Following this the grounds were landscaped and became a public garden. Today the motte, keep and high tower remain in a relatively good state of preservation. Visitors can climb the stairs to the top of the tower and take in the view over the town and countryside below. 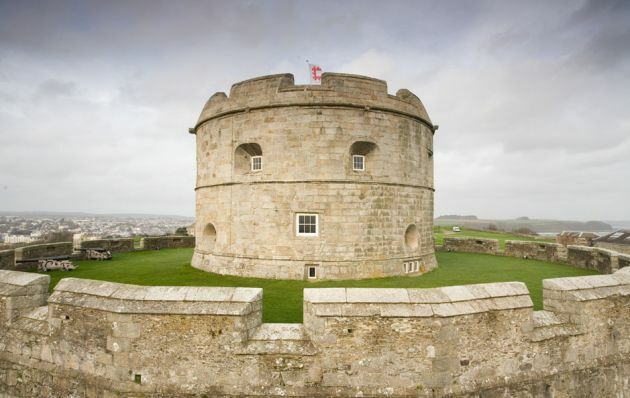 Pendennis Castle was built in the mid 1500s to guard the entrance to the Fal Estuary along with its twin, St Mawes Castle on the opposite headland. The castle occupies a site high on a hill commanding fantastic views over the town and beaches below. 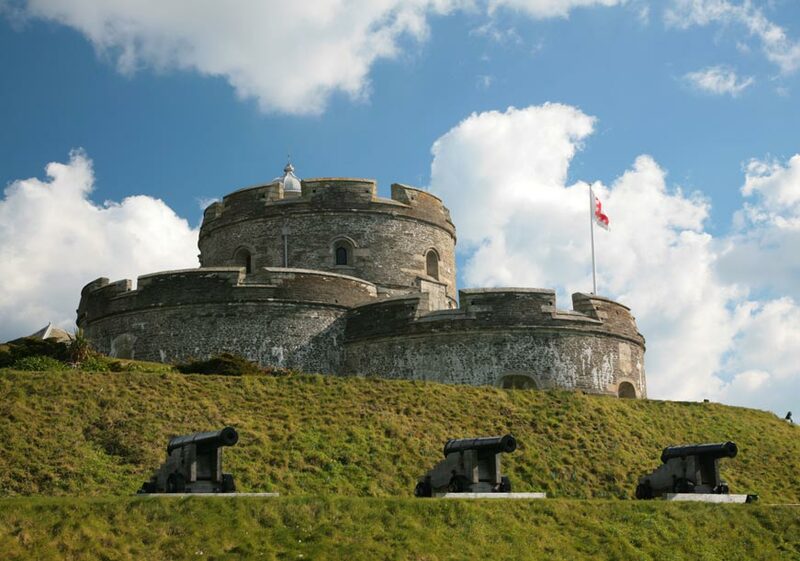 While St Mawes castle was built as something of a showpiece with its architectural flourishes and decorative carvings, Pendennis was a more functional affair. The original building consisted of a simple round keep surrounded by a curtain wall. 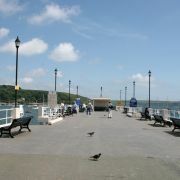 Over the centuries Pendennis was extended and adapted to counter the threat of the day. Additional fortifications were instated prior to the English Civil War and these saw the fortress held for 6 months against the parliamentary forces. Up until the end of World War II Pendennis was being extended and adapted with various buildings, storehouses and barracks being constructed, altered or replaced, and the weaponry of the castle constantly updated. Today the site is managed by English Heritage who have made great efforts to bring castle's history to life. There are reconstructions in several rooms, allowing visitors to see what life in the castle was like during different periods of history. The Discovery Centre has interactive displays and activities, and medieval re-enactments are frequently staged at Pendennis.